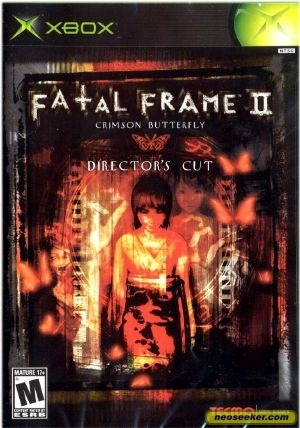 STORY: Like the first game that came out on the Xbox and PS2 in 2002, Fatal Frame 2 puts you in a haunted world where your only weapon is a camera. That\'s right. A camera. This is no ordinary camera, mind you--this one has the ability to exorcise demons/ghosts by taking their pictures. You play as Mio and Mayu, twin girls that have stumbled upon a supposedly \'lost\' city while wandering in a forest. You soon come upon a camera, and you find out that you can hurt ghosts with it. Great. Now we just have to find some ghosts... ...like the one standing right behind you... This game has some creepy moments that will have you hitting \'pause\' just to catch your breath.